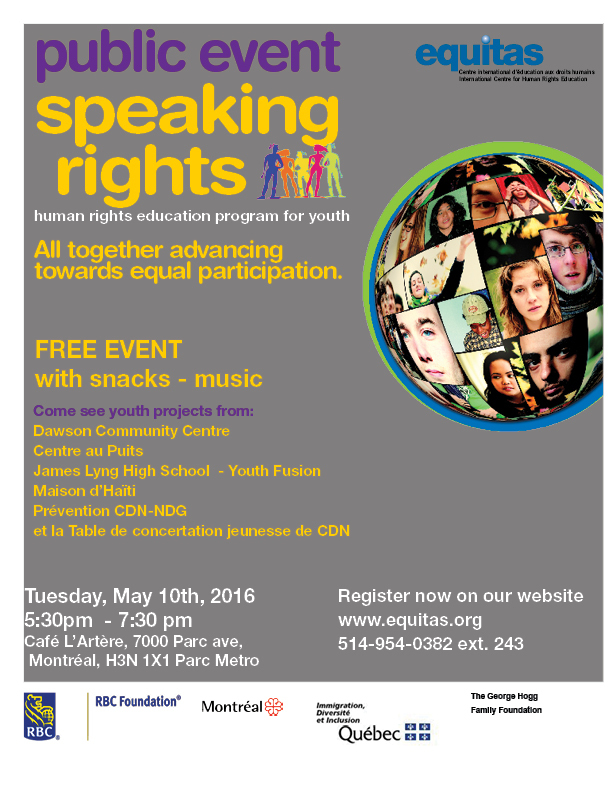 Invitation – A Montréal Speaking Rights Celebration! Home » Events » Invitation – A Montréal Speaking Rights Celebration! For the last 5 years, Equitas’ Speaking Rights program has been supporting youth engagement projects across Montreal. These projects are opportunities for youth organizations to benefit from a small amount of financial support and Equitas’ coaching and support to implement activities allowing youth to play an active and positive role within their communities. This year, we would like to underscore the quality of their work through a unique public event! WHEN : Come meet with engaged youth on Tuesday, May 10th, from 5:30pm to 7:30pm. WHERE : Coop Café L’Artère, 7000 Parc Ave, Montréal, QC H3N 1X1. WHO : Youth from community organizations will be presenting their projects and sharing how their actions have contributed to positive changes in their communities: • Dawson Community Centre • Centre au Puits • James Lyng High School – Youth Fusion • Prévention CDN-NDG et la Table de concertation Jeunesse de Côte-des-Neiges • Maison d’Haïti Snacks, music and youth expression will be offered. *** to rsvp, please fill out the form below! We invite you to circulate this invitation among your networks and among your youth!